Last edited by Rod Trussbroken; 08-05-2005 at 05:26 AM. "when he lays a bass line down it stays there"
Hi all, I've got a stingray5 translucent orange with black pearloid pickguard and its serial number is E40791. 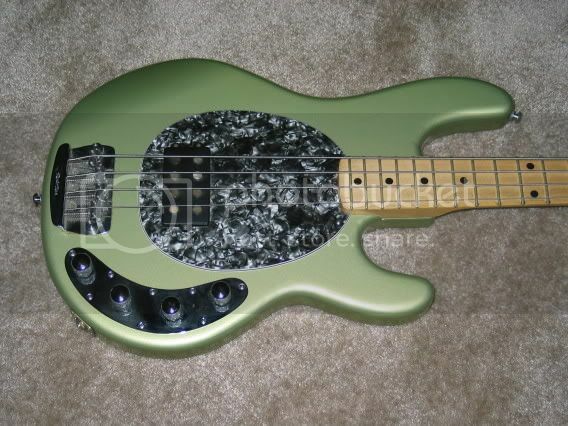 As the musicman customer service answered it was made in april 2005. In the serial list of your site, the numbers before and after mine's are dated about april 2004. Yes, I see what you mean. It's possible Customer Service made a mistake with respect to the year of manufacture. I would have said 2004. I sometimes get the years mixed up. their mail says "Your bass was made up in april 2005, it's indeed brandnew", so I think they didn't made a mistake...but I'll try writing them again. Last edited by bassbara; 08-16-2005 at 05:19 AM. Sometimes serials don't follow chronological order. If EB says 2005 then it's 2005. Aziah. Thanks for the info. Much appreciated. Barbara. Thank you too for clearing up the year issue. Last edited by Rod Trussbroken; 07-02-2018 at 06:02 PM. He`s an SR5 by the way. It took me a little bit to get used to the mids and get it dialed in with my ampeg 3pro/410hlf but I`m getting very favorable comments about the sound with this combination.Actually,I pretty much leave all the amp controls flat and make the changes at the bass. Thanks again for the info on my boy !! One more thing.....I would like to change the hardware to gold,I think it would dress it up nicely,,,,Does anybody sell gold hardware for the SR5? I don't know whether you were looking for a specific date on your Bass but it appears to be an early 1992. I've added it to the serial list.